Yes, you read that correctly–I put chocolate, maple and bacon together. In a cupcake. Win, win, win, win! 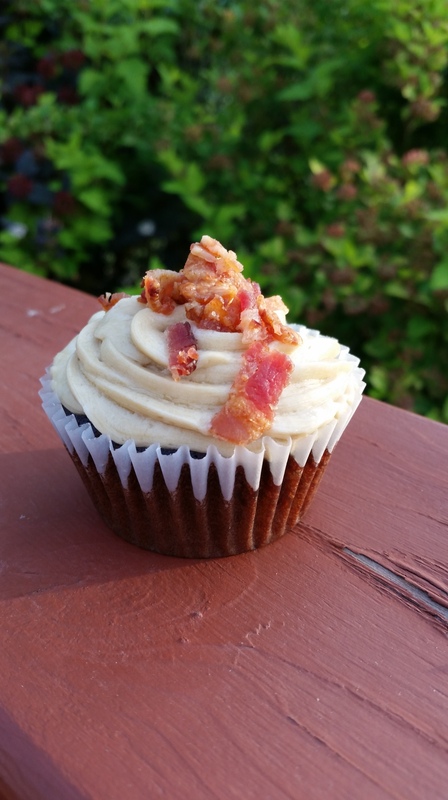 I got the idea from this bacon cupcake but honestly didn’t really follow that recipe at all. For starters, that cake recipe called for sour cream, which is really impossible to substitute for when one is trying to make it dairy free. But the part that really turned me off of that recipe was that she put chopped up bacon inside the batter. 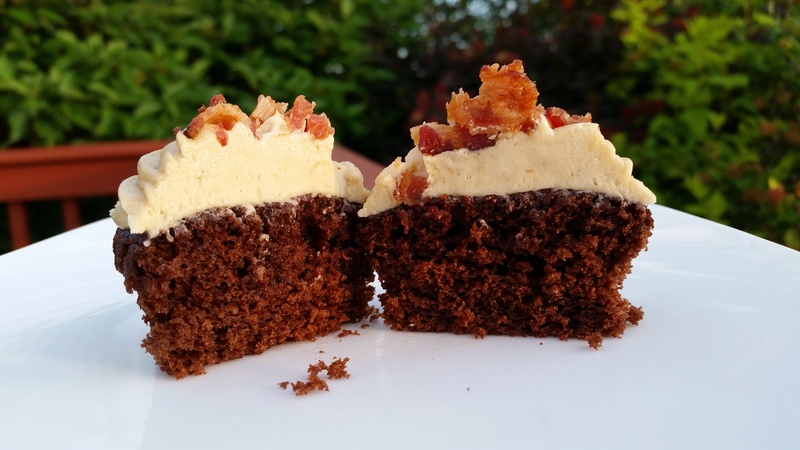 I do not like soft bacon, and I knew that there was no way for the bacon to stay crispy after being baked inside a cupcake. 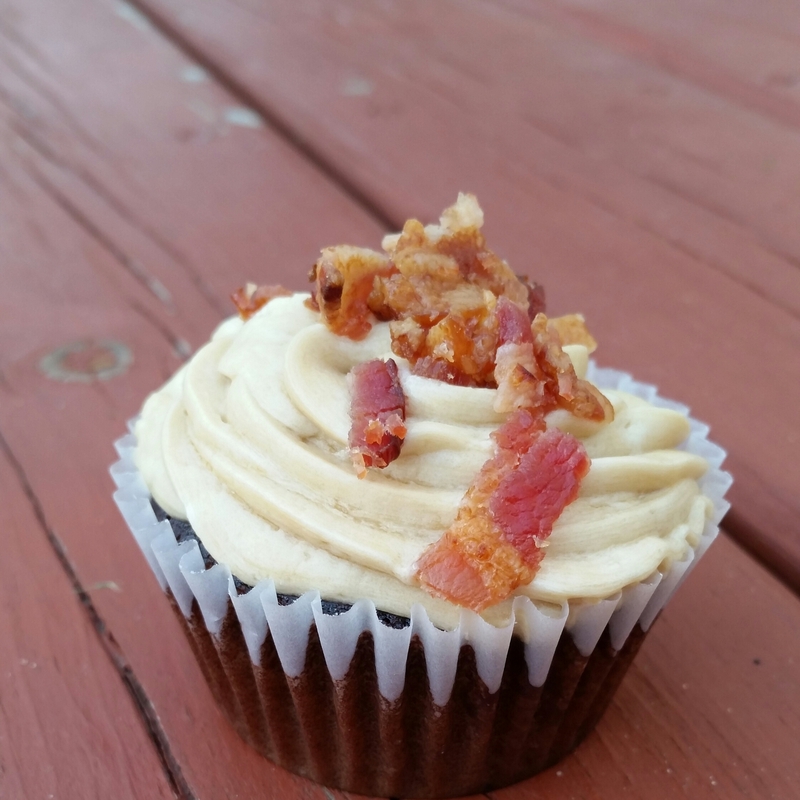 So I took this marvelous idea for a bacon cupcake and made it my own. The cake recipe is from one of my favorite dessert cookbooks: Hershey’s Recipe Collection. I’ve had this since my single days, and I love it! Since I knew that the bacon and maple frosting was going to be pretty heavy, I wanted to go with a light and fluffy cake instead of dense and moist like I would usually pick. Hershey’s “1st Birthday Cupcakes” were exactly what I was looking for. Light, soft, fluffy, chocolately goodness, but not dry. There’s not as much cocoa powder in this recipe as compared to most other chocolate cake recipes, putting it more in the family of red velvet, but without all the food coloring. It’s perfect if you want a chocolate cake that still has all the glory that is chocolate without weighing you down. A note before I dive into the recipe: it calls for buttermilk, which can normally be substituted with a regular milk that is “soured” by distilled white vinegar. If you decide to use soy milk (or regular cow milk if you don’t have any allergies to worry about), then you can add the vinegar to the milk and then add that mixture to the batter. However, if you are using almond milk like I did, do NOT add the vinegar directly to the milk. It causes it to separate and when you add it to the batter, it doesn’t incorporate well. You have to add the milk and vinegar to the batter separately. Moreover, if you are a dairy eater and are using buttermilk, then omit the vinegar completely. So here’s the recipe for these little lovelies (it will make a little over 2 dozen cupcakes). Pour the almond milk into a glass measuring cup and mix in the baking powder. Baking powder is liquid reactive, so this will allow it to start activating before you add it into the batter, and give the batter a fluffier texture. Cream the shortening with 1/2 cup of sifted sugar with the flat beater attachment until smooth. Add the eggs, mixing well after each one. Add the baking soda, salt, and vanilla extract, allowing them to mix in. Next, add the flour and cocoa powder. As you start the mixer, slowly add the almond milk so that the batter stays moist and doesn’t get crumbly. Once everything is incorporated nicely, add in the vinegar. Pour into cupcake pans and bake at 350 degrees for 20 minutes, or until it springs back when touched. Now that the cupcakes are baked, let’s move on to the maple frosting. As is the case with all of my frosting recipes, I did use a stick of margarine, which is not 100% dairy free. It contains the milk derivative ‘whey’. So if you have an allergy that cannot tolerate whey, you can use all vegetable shortening instead. Trust me, it will still be just as delicious! I used to roll my eyes whenever I read “room temperature” anything in baking recipes, but I am noticing that it really makes a huge difference to use room temperature margarine where frosting is concerned. It’s just too hard to get it to smooth out nicely if it’s too cold. What’s that? You don’t have the patience or planning abilities to remember to set a stick of margarine out 2 hours before you’re ready to start baking? Me neither! Here’s a nice hack for you: put the stick of margarine in a microwave safe bowl, cover it with a paper towel to contain potential splatters, and pop it in the microwave for 10-15 seconds. And just like that, you have room temperature margarine! Just be careful to not over heat it, which can happen quickly in the microwave. If it gets melty then you’ll have to trash it and try again. Runny margarine will completely ruin the texture of the frosting. Once the margarine is room temperature, cream it using the flat beater attachment on the ‘2’ setting until it’s smooth. Add the vegetable shortening and cream it on the ‘2’ setting, again until smooth. This may take a bit, and you may be tempted to up the speed, but don’t do it! Incorporating too much air is the death of smooth frosting. Add in the first 2 cups of sifted powdered sugar 1 cup at a time, allowing it to completely mix in before adding more. After the second cup of powdered sugar, add in the maple syrup and vanilla extract. Lastly, add in the sea salt. I feel that this part is all a matter of preference, so start with 1/2 teaspoon and taste it before adding in the other 1/2. I ended up going with a full teaspoon, but honestly once I topped it with bacon, it was almost a tad too salty. So take the sodium in the bacon into consideration too. Don’t get me wrong, the cupcakes were still awesome. I just realize that it might be a bit much for some people. Then of course, there’s the most important component–the BACON! I used a total of 8 pieces of bacon. Personally, I like to cook my bacon in the oven because then there isn’t a bunch of grease splatters to clean up. 375 degrees for 20 minutes on a foil lined cookie sheet (it has to be a cookie sheet with a lip so the grease doesn’t spill out). When they’re done, pat the grease off with some paper towels. Then chop them up into little crunchy bits. I chose to swirl the maple frosting on with my large open star tip, but use whatever you fancy. 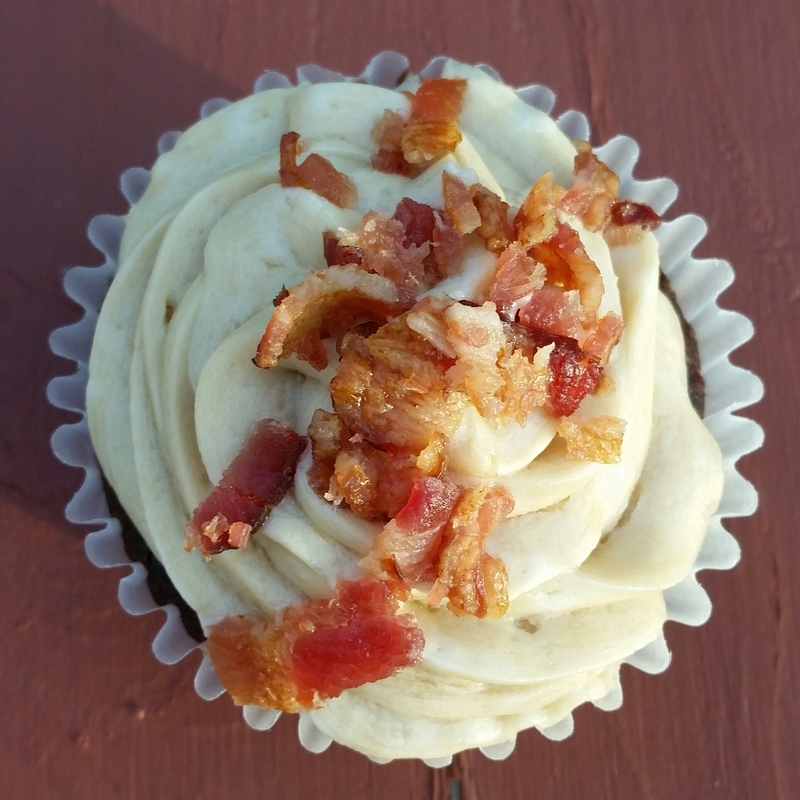 The frosting really just serves as the pillow to hold up the real prize of this cupcake–the bacon. It’s definitely more of a savory cupcake because it really isn’t very sweet. The chocolate and maple flavors are perfect side kicks to help highlight the salty, smokey, awesomeness that is bacon. I made them for Father’s Day, because they just seemed like a ‘manly’ cupcake. I mean, what guy doesn’t love bacon, right? Now I won’t lie to you–not everyone was crazy about them. They’re definitely a unique flavor that not everyone will be keen on. But the majority of people at the celebration really enjoyed them. Bottom line–if you love bacon, you need to try these, because I don’t believe you will be disappointed!